Dato Method and Advanced Dato Method are stringing methods that allow badminton racquets to be strung at extremely high tensions. Both methods were developed in Calgary by stringers at Racquet Network over a period of years between 2004 and 2018. The word “dato” means “beloved”. The term “Dato Method” reflects the love and attention to detail that the racquet stringer puts into his/her work when using this method to string badminton racquets. Dato Method racquet stringing is a center-out stringing technique for badminton racquets that utilizes one piece of string and two Parnell knots. 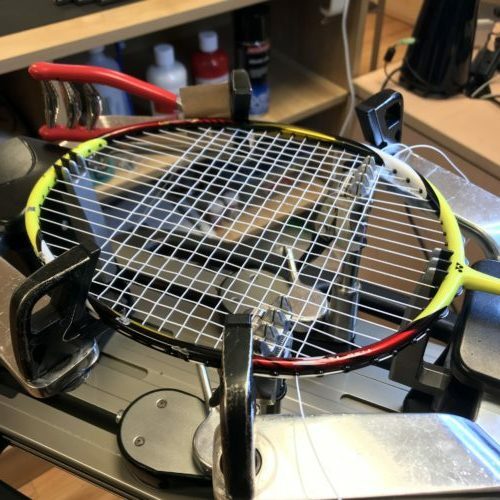 It can use used at any tension, but it was created as a way to string at high tension while minimized the chances of breakage during stringing. Dato Method represents a major advance over traditional high tension stringing methods in which stringers over-tension some areas of the string bed and under-tension other areas while hoping to achieve an estimated overall tension. Dato Method stringing ensures that every string in a badminton racquet is pulled to a very specific tension. There are no estimates in Dato Method. The pattern followed allows stringers to string racquets at extremely high and extremely precise tensions without breaking the frames. Advanced Dato Method stringing allows the customer to specify different tensions on different strings. For example, a customer may want the center mains or crosses to be at 0.2 lbs higher tension than outside mains or crosses. Or they may want to increase tension by 0.1 lbs on every main string outside of the sweet spot. At Racquet Network, all Dato Method stringing occurs after hours when there are no distractions and the stringer cannot be rushed. Pull speeds are reduced to absolute minimums and several pauses are built into the stringing process in order to allow the frame to absorb all of the additional tension. When performing the Dato Method, stringers double back on the outside mains and then string the middle crosses first. This prevents the loop from becoming deformed at either the top or the bottom. Once the loop is stabilized by installation of the middle crosses, they complete the bottom crosses This ensures that loop is fully stabilized before starting the weakest part of the frame, which is the top of the loop furthest from the handle. When stringing at tensions over 32 lbs., Dato Method stringers take additional steps to stabilize both the top and bottom of the loop order to prevent it from changing shape while they are stringing the mains. In addition to the steps above, the stringing machine must be precisely re-calibrated immediately prior to all high tension stringing jobs. All of these extra steps and precautions increase the stringing time from about 20 minutes (standard stringing) to well over an hour. The higher the tension, the longer it takes. Hence, the relevance of the term “Dato”.